Dog meat, a delicacy in some parts of the Northern and Eastern regions but frowned upon in most parts of the country, has now become a delicacy in some suburbs of the Greater Accra Region, especially Bukom, Korle Gonno, Chorkor and Nungua. Worshippers of the Tigare fetish, which originated from the Northern Region, are known to eat dogs, which are the principal animals used for their rituals. Auntie Adjeley Doku of Mamprobi whose late father, Nii Adjei is reputed to have brought the Tigare fetish from the north to Accra, explained that instead of the use of sheep in rituals at the shrine, dogs are used. “Of course, when it is thus used it is cooked and we all eat the meat in either a soup or a stew,” she explained. “Anyone who eats dog meat cannot be harmed spiritually by any evil doer. This is because just as the dog protects its owner in real life, so does it do so spiritually, and no witch or evil doer can harm you if you eat the meat of a dog”, she added. Auntie Adjeley also believes that more people are beginning to enjoy the meat because they now know its spiritual value; moreover it is very delicious, just like other meat. It is also known that some people in the Greater Accra Region, apart from the Tigare worshippers, use the dog instead of sheep for their customary rites. At funerals, outdoorings, engagements and other social events, especially in Chorkor, dog meat is served as part of the meals eaten. The youth also come together at weekends to prepare and consume soup and stews made with dog meat along with banku, gari or fufu. At Korle-Bu Sempe, a young woman who wanted to remain anonymous narrated how she joined her brother and friends to eat a delicious meal of gari and stew, only to be told later that the wonderful meat she had was dog meat. She explained that even though she would not have eaten it if she had known it was dog meat, she realised after the meal that, it was no different from mutton. The brother said he was introduced to the meat by his friends with whom he enjoys cat meat. According to him, it is really good and recommends it to everybody. “It is funny the way people behave over the eating of dog meat. I ate it because I knew other people eat it elsewhere, and once it's good, I have no qualms about it as long as it's neatly prepared” , he emphasised. Another lady, Esi, who stays at Chorkor said the first time she ate the meat was at Atibie Kwahu in the Eastern Region. According to her, she and her friend went to a chop bar and her friend requested for it. After she tasted it, she realised it was good and she enjoyed it very much. Nicknames given to the meat at Chorkor are 'me you' and 'ogele' and those who enjoy it refer to the meat as such. This reporter was told the story of some ladies who went to a funeral at Chorkor and were given seats in a friend's room. While they were being served with drinks they saw a pan full of meat and so they took a few chunks to go with their drinks. “It was so delicious, so when our friend served us kenkey and fish, we requested for some of the mutton in the pan, her reply of “Oh! Do you like the dog meat?” was enough to kill our appetites”. 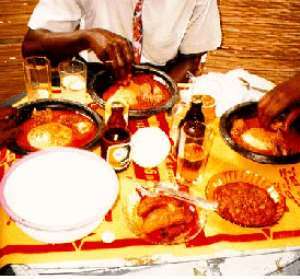 At Nungua, behind the Ravico Hotel, is a joint where Brukutu, a popular local drink, is served with dog meat, either as spicy khebab or in soup for those who request for it. Emmanuel Okwei-Addo of Korle Gonno believes that more people are taking to dog meat these days because they are easy to come by and also people are discarding their revulsion for the meat because they have realised that eating it does not cause any harm. Meanwhile, it is common knowledge that the mere mention of “dog meat” makes many people spit and turn away. To these people, the dog has always been man's closest pet and companion and so they cannot conceive the idea of killing it, let alone eating its meat. Others too are put off by the fact that they see the dog in all kinds of 'compromising' situations and so they find it difficult to consume its meat. But this notwithstanding, it appears that dog meat is attracting more 'adherents' who, rightly or wrongly, may be telling those who find it repulsive: “You dom't know what you are missing!”.